Property 19: Beautifully tucked away in the heart of town. Property 20: Delightful two bedroomed lodge in a beautiful, quiet peaceful location. Property 23: Stylish Beach Cottage Sleeps 4 - 6, just 85 mtrs from sandy 'Blue Flag' beach. Property 39: Beautiful beach style Cabin Near Bantham Beach, Devon, With Wifi. 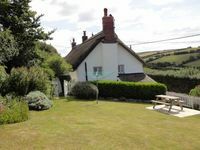 Property 45: Shepherds Patch Is A Large Thatched Cottage In Thurlestone with a parking space.